One of the famous six communities (next to Listrac-Médoc. Margaux. Moulis. 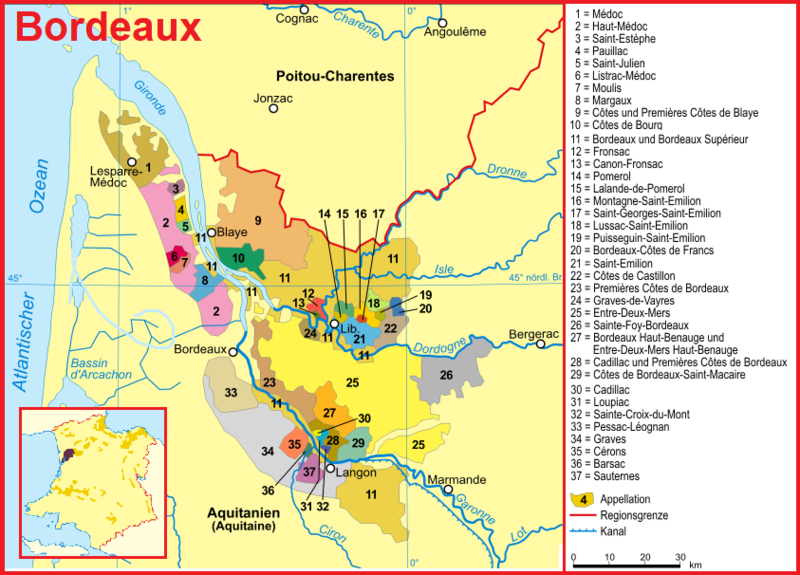 Pauillac and Saint-Julien ) within the French area Haut-Médoc, which are their own appellations and may bear the name of the municipality on the bottle label. It is the northernmost municipality and covers approximately 1,380 hectares of vineyards nearly 50 kilometers north of Bordeaux, The area is one of the oldest vineyards in the Médoc and dates back to the 13th century. Saint-Estèphe is located at the mouth of the estuary Gironde and was a major port at the time. The loamy subsoil over a ferrous stone layer consists of clay, mixed with stones clay and lime. The soils are more fertile than in the southern communities. In addition to the dominant variety Cabernet Sauvignon there is a relatively high proportion of Merlot, The tannin-rich, color-intensive, long-lived red wines are characterized by more acid than the other five.